Union County commuters to NYC – get ready to pay more! You may have missed the news, like we did. But the bridges and tunnels raised their tolls last week. You can save on your commuting expenses by registering in the Carpool Plan and/or Green Pass. What is the Carpool Plan? You can save $4.00 off peak and $6.00 peak if you are a member of the Port Authority Carpool Discount Plan – pay only $4.25 per trip, on or off peak. To apply for the Carpool plan, call 800-333-8655 (New York Service Center) or 888-288-6865 (New Jersey Service Center). Be sure to have your account number or tag number and PIN when you call. The discounted rate is only in effect if you have 3 or more people in your vehicle and if you use a staffed “Cash EZ Pass” lane. You must come to a complete stop so the toll collector can verify that you have 3 or more people in your car. What is the Green Pass? Low emission vehicles that are certified to the California Super Ultra Low Emission Vehicle (SULEV) standard and achieve a United State Environmental Protection Agency (USEPA) highway fuel economy rating of 45 miles per gallon or more can travel off-peak and save. The toll for qualifying vehicles is only $4.75 off peak. All vehicles on New York’s Clean Pass Program Vehicle Eligibility List are eligible for the Port Authority Green Pass Discount Plan. To enroll in the Green Pass Discount Plan, call 800-333-8655 (New York Service Center) or 888-288-6865 (New Jersey Service Center) and be sure to have your account number or tag number and PIN for account access. 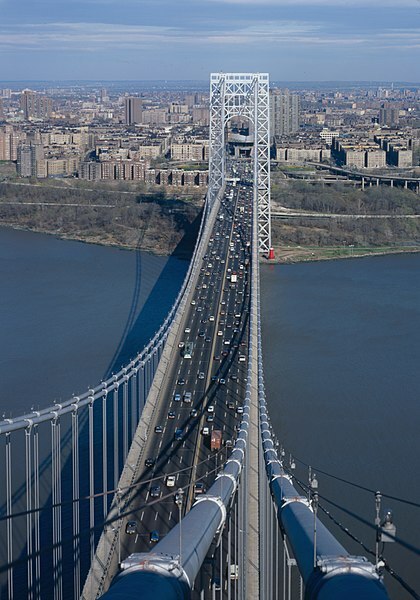 Cash customers are not permitted on the lower level of the George Washington Bridge overnight (11pm-6am Sundays through Thursdays, 11pm-7am Fridays and Saturdays). Tolls collectors may accept bills up to $100 but will not accept checks, money orders, credit cards, or traveler’s checks. They will also not accpet currency other than US, nor will they accept small change, pennies, or wrapped coins. They can give you a receipt, but only if you ask.